Use Qiagen RNeasy Kit with QIAshredder columns for homogenization, and use RNA carrier on the pelletted samples from those 4 crabs. 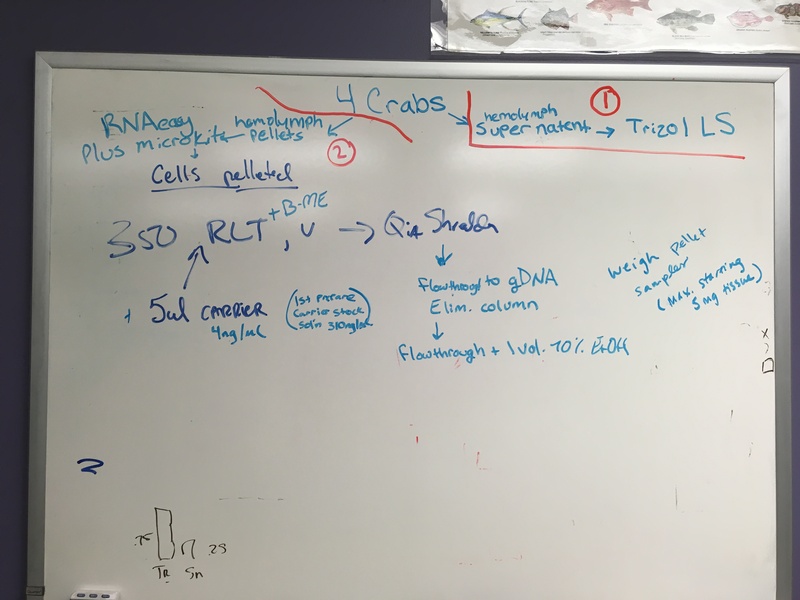 If there is RNA in supernatant, we could combine pellet and supernatant to get higher yields of RNA per sample… (GitHub Issue with Crab Project Next Steps). Each tube contained ~1.5ml of supernatant. 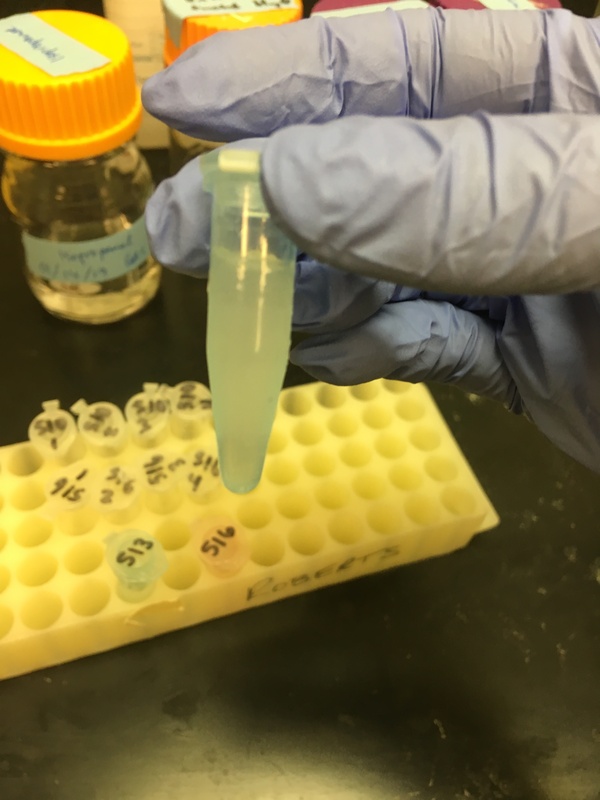 To keep the ratios simpler, I separated the samples into four tubes, so that each sample was now 4 tubes of 250ul of supernatant each (16 tubes total). Centrifuge samples for 15mins at 12,000 g at 4C. After this, the samples should separate into three phases: a lower red phenol-chloroform, interphase, and an upper colorless aqueous phase. Transfer the aquaous phase containing the RNA into a new tube. During this step, the volumes that were transfered for each sample weren’t equal. 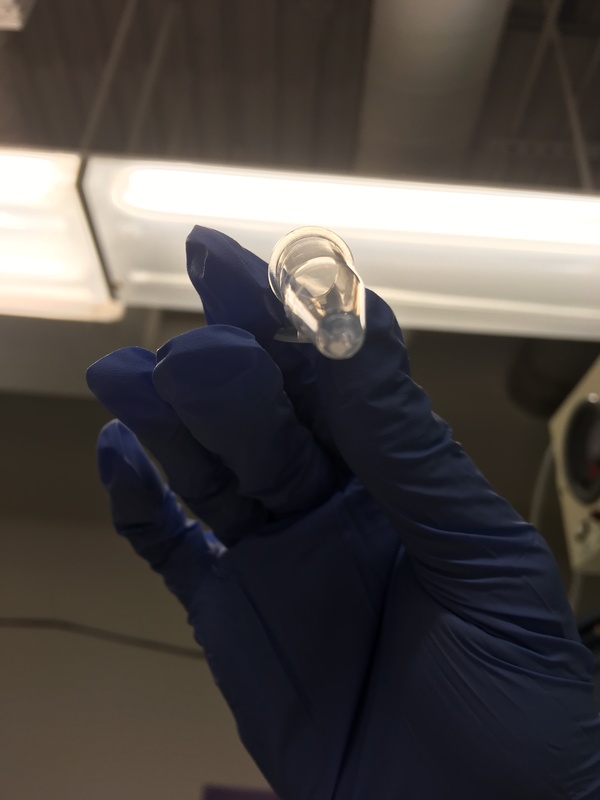 For one of the tubes from sample 516, I accidentally discarded about 200ul of the aqueous phase… but was able to transfer a little less than 200ul afterwards because there was still some left. Question: should I have aimed to transfer the same volume for each tube? Centrifuge for 10 mins at 12,000 g at 4C. 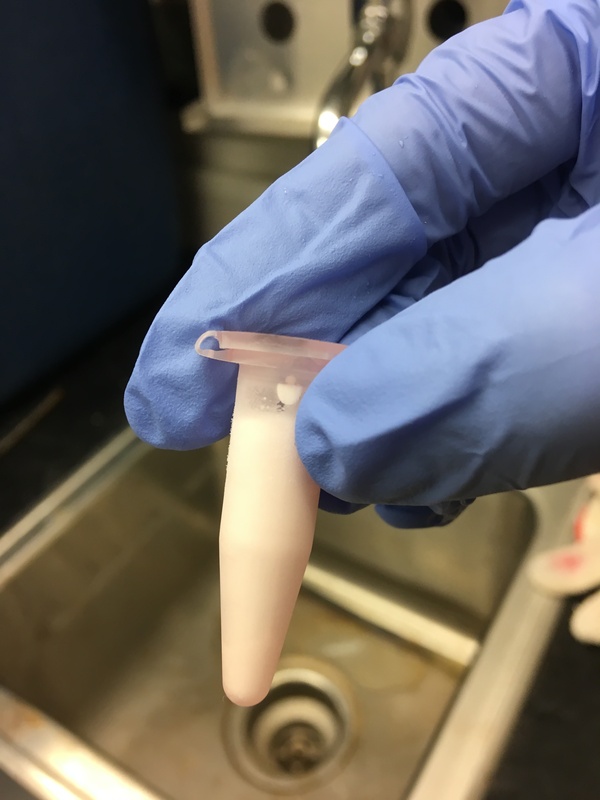 Total RNA forms a white gel-like pellet at bottom of the tube. During this part, I posted an issue on GitHub (#581) asking when I should recombine the 4 tubes into one sample. Sam suggested I do it during the precipitation section by centrifuging 1 out of the 4 tubes, discarding the supernatant, and then adding the contents of the second tube of the four to that first tube, centrifuge, and discard the supernatant, and so on. Before seeing that Steven suggested I talk to Shelly as well, I started doing what was suggested and centrifuged 1 out of 4 of each of the samples. While those 4 were in the centrifuge, Shelly and I talked and she made the point that all of the volumes in the remainder of the protocol are based on the initial volume of Trizol LS used (in this case, 750ul per sample). 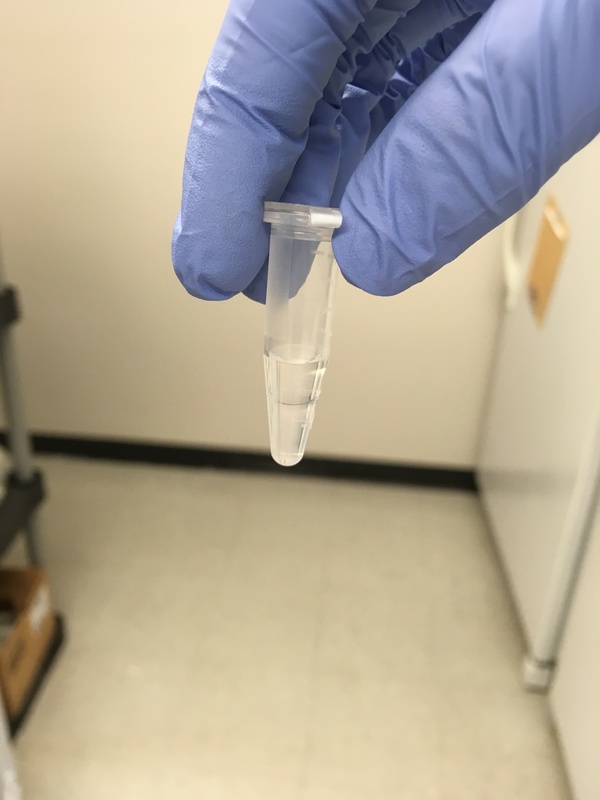 By combining 4 tubes into 1 sample, I’d then have to quadruple all the volumes of the remaining reagents for the rest of the protocol, so instead we decided it would be easier to combine samples during the solubilization step of isolating RNA (will describe later). Resuspend (by pipetting up and down) the pellet in 1ml of 75% ethanol. Vortex briefly (3 s), then centrifuge for 5mins at 7500g at 4C. Air dry pellet for 5-10 mins. During the drying step, I discarded the supernatant and left the samples to dry for 10 mins. 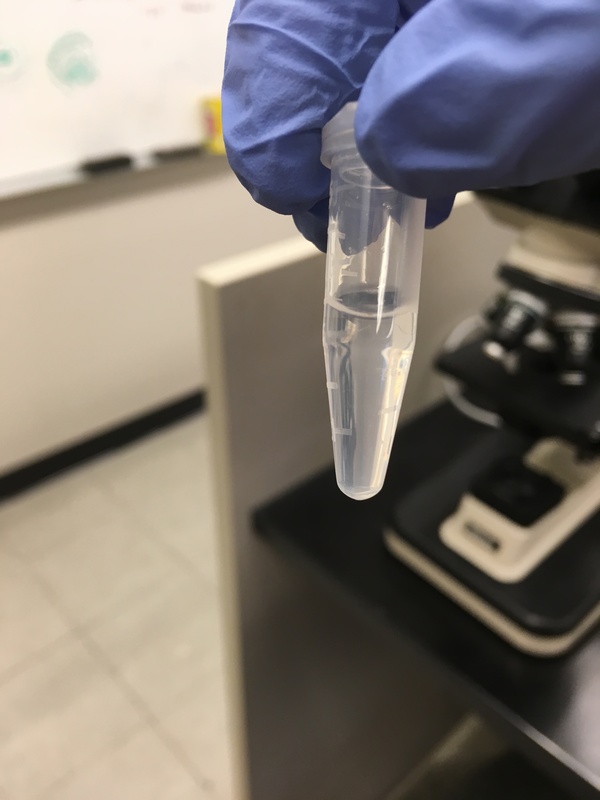 When I looked at them after 10mins, I realized there was still too much liquid, so I used a smaller pipet to pull off more supernatant and then let them air dry for 10 more mins… Not sure if this was a bad idea. Resuspend the pellet in 20ul of RNase-free water - I used 0.1% DEPC-treated water. Incubate on a heat block at 55C for 15 mins. 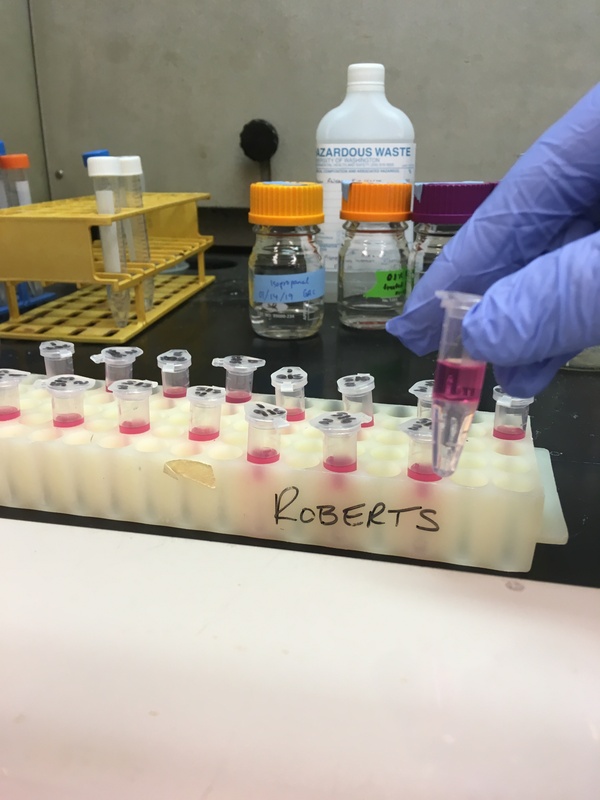 For the resuspension, I did what Shelly and I discussed and used this step to recombine the 4 tubes for each sample into 1. 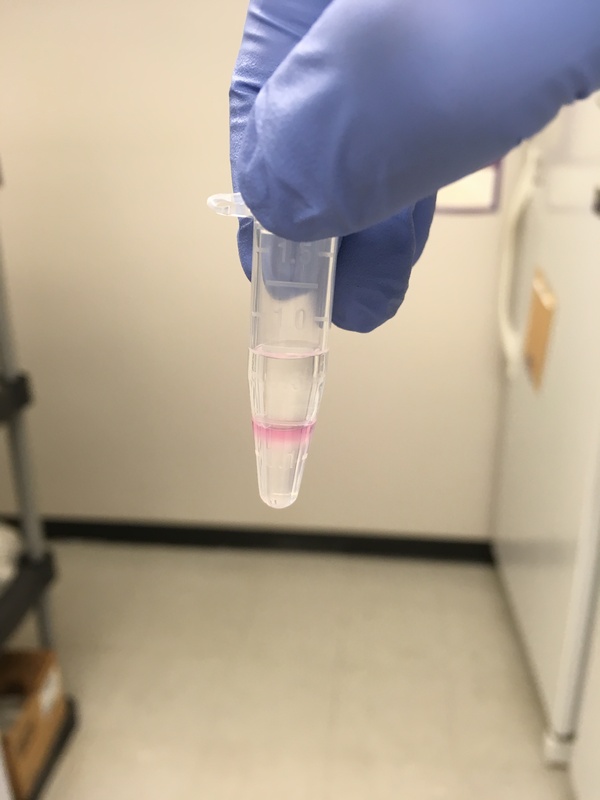 I did this by starting with one of the 4 tubes, adding 20ul of RNase free water, pipetting up and down to resuspend pellet, then sucked it all up into the pipet tip, and deposited it in the second of the four tubes. Then I pipetting up and down to resuspend that second pellet, increased the volume on the pipet tip so that I could transfer the whole sample, and desposited it in the third of the four tubes… and so on. By the end of the resuspensions, each sample tube ended up with somewhere between 24 and 25 ul. I ran 1ul of each sample on the Qubit using RNA High Sensitivity reagents. Unfortunately, none of the samples had any detectable RNA. They all said “Out of Range: TOO LOW”. I saved the samples anyway, and put them in my RNA extraction protocols test box in the -80 (Rack 5, column 4, row 3).